I read this article and found it very interesting, thought it might be something for you. The article is called Ignited Hopes, No Jobs. Why Jats, Others Revolt and is located at https://archive.indiaspend.com/cover-story/ignited-hopes-no-jobs-why-jats-others-revolt-84928. 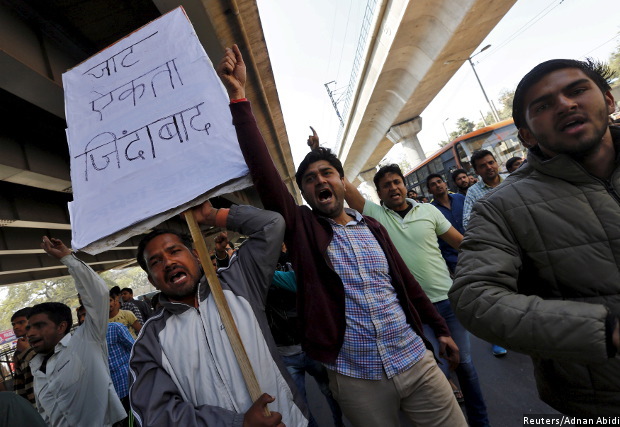 Demonstrators from the Jat community shout slogans during a protest in New Delhi, India. A violent week-long agitation by the community demanding classification as a “backward” caste has left 19 dead, vehicles and railway stations burnt, and the army deployed. Sonipat, Gurgaon, New Delhi: Square-jawed, cleft chin and hair untidily spiked, Vikas Thakaran glowered as he explained why he was here in this scrum of young men blocking Bakhtawar chowk, 30 km southwest of India’s capital, part of a violent week-long agitation that has left 12 dead, vehicles and railway stations burnt, and the army deployed. Thakaran, 24, is a computer-science engineer, but he is unemployed. 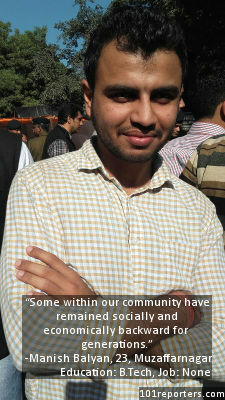 “I applied for government jobs four-five times, many times elsewhere, but I didn’t get through,” he told IndiaSpend. We found many educated, angry and either unemployed young men like Thakaran, or those unable to find a job commensurate with their aspirations and education, among the thousands of protestors from a caste group that many say has no reason to protest. I still don't understand why Jats need reservations. Even richest people give them space on roads when they read "Jat Boy Inside. Stay Far"
Traditional landowners, the Jats are a powerful Hindu caste now demanding classification as a “backward” caste–a contention rejected last year by the Supreme Court–so that government jobs can be reserved for them. However, an IndiaSpend analysis of employment data and evaluation of aspirations of young Jats revealed that the protests are manifestations of India’s slow, inadequate job-creation and a failing education system creating thousands of “unemployable” graduates. This disconnect between education, aspirations and jobs explains similar demands to be classified as “backward” and “other-backward-caste (OBC)” by socially powerful caste groups–Gujjars (Rajasthan), Marathas (Maharashtra), Patels (Gujarat) and Kapus (Andhra Pradesh), among others–struggling to find satisfactory employment. Saurabh Rangi, 24, a native of Rohtak city, scored 75% in the All India Engineering Entrance Exam (AIEEE), but he is on the streets of Haryana’s Gurgaon city–30 km northwest of Delhi–because he did not get admission to a government college and had to pay “lakhs” to graduate from a private college. Rangi is angry; he holds a public-relations trainee job at cardekho.com, an automobile website, but wants a government job. Labourers, guards and maids form the majority of the jobs available to more than a million Indians–some estimate it is nearly two million–who join the workforce every month, as IndiaSpend reported. As we explain later, over 30 years, India generated no more than seven million jobs every year, with only a fraction being the kinds of jobs the young Jats desire. This is why protestors across India demand secure government jobs; it is why engineers and doctors throng job openings for peons, clerks and constables (as they did in Uttar Pradesh last year, when 2.3 million applied for 368 positions of peons). As we also reported, new employment data indicate two disquieting trends. One, a slowdown in employment in the formal, organised sector (which in any case employs only 12% of India’s labour force), the prime staging ground of Prime Minister Narendra Modi’s Make-in-India programme. In Indian factories, more than 400,000 people lost their jobs during the financial year 2012-13, according to government data. Two, this slowdown hides a larger, long-term trend: India Inc is automating and squeezing more output from its workers and so needs fewer of them. In isolation, the latest government data show that organised industry added nearly 500,000 jobs in 2013-14. Unemployment in India, according to labour ministry data, is less than 5%, but these data do not reflect under-, partial- or disguised-employment, such as Rangi’s. No more than 17% of all Indians were wage earners, as this 2013-14 labour ministry report acknowledged, with no more than 60% of those above 15 years old who sought work over the year getting it (more than 46% in urban India did not find work). With so many unemployable, how will reservations solve the jobs problem? We heard similar stories of unemployment and resentment among many Jat youth in Haryana and UP. 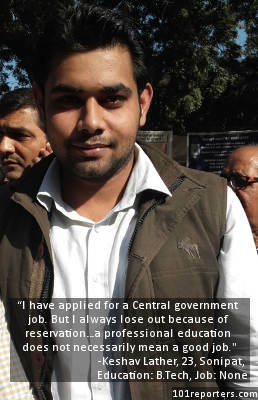 Amit Neniwal, 26, of Malikpur, Jhajjar, 72 km west of Delhi, studying to be a company secretary, spoke of the constant mental strain of ending up like his friends–unemployed. Much of this under-achievement and frustration is a result of a growing population and shrinking farmland. Those who move off the farm often find that an education isn’t enough. For instance, no more than 3% of engineers who want software or core engineering jobs are good enough for such jobs, with 74% poor in English skills and 58% lacking adequate analytical or quantitative skills, according to this study by Aspiring Minds, an employability solutions company. The Centre, on February 21, acceded to some Jat-reservation demands, but will reservations alone solve the larger problem of unemployment? That is unlikely. India needs 23 million jobs annually, according to a Kotak Securities report, but over the last 30 years, the country has created about 7 million jobs every year. In 2012, India created 9.9 million jobs. A Gross Domestic Product (GDP) growth rate of 9%–the government expects a GDP growth rate between 7% and 7.5%–will create no more than 12.9 million jobs, falling short by almost half. The United Nations has said India will have the world’s largest youth population by 2020, and that population, in the age-group of 15-34, grew from 353 million in 2001 to 430 million in 2011, with millions unemployed. “What India needs annually is not just 23 or 24 million jobs but livelihoods,” said economist Ajit Ranade. The Kotak report said more than 250 million people would be looking for jobs over the next 10 years, as more women enter the workforce. This number has not taken account people who will migrate from agriculture. Even if that happens, there are issues of efficiency–and slower job growth–to consider. Agriculture–which provides 60% of all jobs–reported the largest absolute decline over five years leading to 2009-10, 15.7 million, according to this Mint report. In the secondary and tertiary sectors, the data show a decline in the rate of jobs created despite moderate growth. From about 65 in 1970-71, the number of workers per factory came down to around 45 by 2012-13. In the information technology sector, 1.4 million sought jobs in 2015, of which 209,000 or 17%, found jobs, according to the Kotak report, a statistic that explains the frustrations among Jat engineers. In the banking sector, net hiring, by government and private banks, fell from 124,857 in 2012 to 33,224 in 2015. Jat youth on the streets do not want informal-sector jobs, as our interviews indicated, but here too, as IndiaSpend has reported, employment declined by 6% since 2004-05—and this is the sector that offers the most jobs, 340 million. Ranade said the government should focus on small and medium enterprises, revamp infrastructure, rationalise tax structures, revive skills in traditional industries, set up technical training institutes producing skilled workers and ensure ease of doing business. Developing new skills and re-skilling older workers is a key approach, but as this IndiaSpend report indicated, the Modi’s massive skill-development effort needs to do much more. “The plan, massively ambitious in scale, aims to train over 40 crore (400 million) Indians by 2022, which equates to approximately one million people per week!” researchers from Harvard University’s Kennedy School of Government wrote for IndiaSpend in December 2015. Liked this story? Indiaspend.org is a non-profit, and we depend on readers like you to drive our public-interest journalism efforts. Donate Rs 500; Rs 1,000, Rs 2,000. Senior economist and columnist Bharat Jhunjhunwala has written in a Hindi newspaper that the entire gambit of reservation or need for affirmative action is sheer political expediency in India. The Black population in the USA too demand affirmative action, but not reservation. However, agitations regularly punctuate the common life on the demand of reservation in government jobs only because government servants are pampered in India. The Institute for Study in Industrial Development revealed in a study in 2007-08 that against the average median pay of an employee in the private sector was Rs. 46,802 per annum, compared to Rs. 410,898 netted on an average by a government employee, besides the vast scope of income from gratification. Thus, a government servant gets nine times more than his counterpart in the private sector. On the other hand, in the USA, it is reverse: The average pay of a government employee is 11 times less compared to an employee in the private sector. As per a study of the World Bank, India tops the list of 100 countries where a government employee nets more than an employee in the private sector. You have said it in your write-up: the problem is unemployability. And you have also indicated that what makes many unemployable is their lack of command over English. Yet, we have government policies (backed by Medieval ideology) of doing everything except teach the right amount of English! It would seem that our government has not heard of a thing called ‘globalisation’. Further, along with the dearth of skills like carpentry or plumbing, where good money can be made, there is this whole unaddressed issue of corruption. This is the major reason why small enterprises are virtually impossible to set up, and then to carry on and generate jobs. No amount of clever economics can substitute good governance! For heavens sake cross check your data. You say 12% is in organised sector, and then link it to your own piece which says 6% of labour force is in the organised sector.